Coffee rust, a disease produced by the Hemileia vastatrix fungus, according to CONCAFE is going to affect 30% of the coffee area which is 172,000 manzanas, according to FUNICA the coffee harvest from this cycle will be 400,000-500,000 quintals smaller, and also due to the low coffee prices, APEN states that we are going to export US$ 70 million dollars less, and CETREX says it will be US$ 100 million less. In the face of this situation, different sectors are saying that they do not have credit, that their coffee is up to 40 years old, and they are demanding a program from the State: coffee renovation (CONCAFE talks about 65,000 manzanas, 38% of the total), support for fertilizers and chemical inputs, and training for technicians. In this article, before rushing into doing estimates, resorting to old technical prescriptions and sticking our hands out for resources, we invite people to study this case and seek real solutions. Now let´s look at the technical part to expand our question. If coffee rust is propagated fundamentally by poor management, and management requires resources, we notice that in the last 6 years we had the best coffee prices in the last 30 years. Why was there no good management of the crop if there were resources? An easy answer inspired by liberal philosophy would be to say that “the producers individually were neglectful”; supported by neoliberalism we would say that “they did not allow the market to work”, whereby the large producers would have dispossessed more quickly the “neglectful” small producers of their coffee lands; and from the perspective of the paternalistic culture of the benefactor state and the donor culture, we would say that it is “because of lack of resources.” These versions are no longer convincing. Do good prices mean better income for the producers? In a study published in the Revista Encuentro, 2012 (“¿Institución patrón-dependiente o indeterminación social? Genealogía crítica del sistema de habilitación en el café”), Mendoza, Fernández and Kuhnekath estimate that 40% of the coffee producers are prisoners of the crop lien system, a century old institution, through which, regardless of the international price, they sell part or all of their coffee between May and July every year at US$ 45/quintal (15+15+15); in other words, the paradox is that coffee generates large amounts of resources, but not necessarily for the small coffee producers who are 90% of the coffee growers in the country. The study also shows that the cost of commercialization, including through the cooperatives, increased; for example, the dry milling at US$6/quintal from before 2000 to $9/quintal in the last 6 years; the manipulation of weight has gotten worse (14% per sack when it is wet) as well as the manipulation of coffee quality (3-4% per sack) to the detriment of the producers. In another study, Bastiaensen, Marchetti, Mendoza and Pérez (“After the Nicaraguan Non-Payment Crisis: Alternatives to Microfinance Narcissism”), presented in the “Microfinance and the New left in Latin America” conference in Belgium November 12-13, 2012, showed that the crisis of the microfinance institutions made agricultural credit drop drastically since 2009, something that surely contributed to the fact that the previously mentioned crop lien system expanded. The zones with the worst roads, non-legalized properties, less organized producers and those with the least presence of financial institutions are where there are more crop lien loans and where the usury is harshest. In other cases the income was “diverted”. Some leaders, manipulating their organizations, bought coffee in the 2011-2012 cycle in an uncontrolled fashion seeking to obtain huge earnings, but they had problems selling the coffee, with warehouses of dry mills even in the months of August and September 2012 seen to be full of coffee; a consequence was that their members received little or no credit, thus making their coffee fields even more vulnerable. Other family members that had credit and received good income for the coffee, did not reinvest in their farms, used those resources for consumption (food, house improvements, purchase of vehicles). It is also necessary to study innovative experiences, two examples of them are mentioned here. 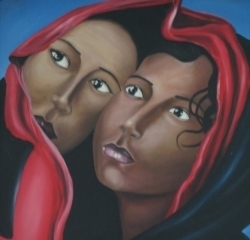 One refers to the combination of technical assistance and financing, between the NITLAPAN institute of the Central American University (UCA) and the micofinance agency the Local Development Fund (FDL). Given the situation of the coffee rust, a quick assessment was done of 40% of the 2,424 clients (coffee producers in the northern part of the country) whose loans will come due between December 2012 and March 2013. 92% of them said that they did not have problems with the payment of the loan nor with the coffee rust, they are producers with good management of their coffee and their farms, some achieving up to 80 quintals/manzana. The plantations that are damaged are those with the oldest plants, without appropriate management, and those of organic coffee. What explains these good results? It is the articulation of three actors, NITLAPAN-UCA, the FDL and the small producers, combining credit, technical assistance and family organization around the renovation of coffee, management of the tissue and the incorporation of trees with multiple services, the opportune use of fertilizers and chemical inputs, management of the pulp and honey waters for the use of biofertilizer and organic fertilizers, that restore the nutrients extracted in the harvest and prevent disease in the plants, investments in wet mills and depulpers. These prudent practices at the family level and in groups have been producing a new type of producer capable of investing in their farms and families, and constitutes an outlook that it is possible to improve their standard of living. 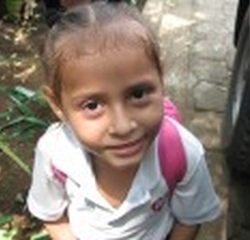 Other innovative experiences are found in first tier cooperatives with less than 60 members and that have credit and technical assistance services, and that sell their coffee either through other second tier cooperatives or directly, particularly when a good part of the credit capital of these organizations comes from the contributions of their members. This type of organization, the minority in reality, have members with better management of their coffee fields, greater investment in the renovation of their coffee, and their members are concentrated in micro-territories. For example, the Solidaridad Cooperative of Matagalpa does not have coffee rust in the fields of their members, because in the last 3 years they have combined technical assistance and the purchase-application of timely inputs, a policy of pruning 20% of their total coffee each year, even overcoming in this way the myth of the bi-annual nature of the coffee harvest (one year a good harvest, and the next a bad harvest); and because they are concentrated in a micro-territory (the community of Aranjuez, Matagalpa). We also find groups of producers whose coffee farms were not affected by the coffee rust, due to the fact that their good management of the coffee is mediated by good family organization (distribution of tasks) and the extended family in micro-territories, a spirit of savings, ongoing investment in their farms, and taking the most advantage of any project (e.g. technical assistance). Coffee rust is part of a chain of scourges. It challenges us to understand coffee growing, the producer families and their social networks, the chain of actors connected to the agricultural production, the complex and historical institutionality, the micro-territories with farm management that generate positive externalities, and also challenges us to look at the good experiences. This even allows us to reflect on them in terms of development models; on the one hand we have a model of extraction from nature (also characterized as low productivity by Núñez, 2012, “the crucial battle for agricultural yields”, Revista Correo No. 20), with a logic of harvesting without investing nor taking care of the farm on the part of the actors, including on the part of the poor workers with low pay, and therefore little motivation to take care of the farms; an unequal model, short term, unsustainable and fragile in the face of any adversity like the current coffee rust. And on the other hand we have a more sustainable growth model, even environmentally more sustainable, that reinvests in fertility, with remunerated producers and with social family density in micro-territories, and supported by human and financial capacity for managing their farms. If the government ignores this reality, does not distinguish between these models, and rather is dragged along by a short term political agenda, then it runs the risk of proposing a solution similar to the CONARCA Plan that affected the ecology and peasant viability in the 80s, to the coffee renovation program of the Chamorro administration that only benefitted the business coffee growers in the 90s, or to the program under the Bolaños administration of restructuring the debts of the coffee producers with the commercial banks and the microfinance institutions, without taking advantage of the moment of the crisis in the coffee prices to launch a program for the transformation of national coffee growting and provide resistance to the periodic price and infestation crises like the coffee rust. CONARCA and the program under the Chamorro administration had in common the direct intervention of the State to promote the adoption of standardized technological packages, while the Bolaños administration thought that the State should not directly intervene, and that it should be left to market forces. A current solution of the massive renovation of coffee fields with a standardized technological package, with subsidized interest rates and organized in a centralized fashion, would benefit the coffee growing business of coffee monocropping that is highly dependent on chemical inputs, and would distort the most interesting cooperative movement, it would affect innovative experiences like those mentioned, and consequently – in harmony with the neoliberal models of the past – would strengthen the old crop lien system and the “motley” intermediation that works against the peasant farmer viability and facilitates the reproduction of “plagues” like coffee rust. The current situation is an opportune time for a new model of more sustainable growth, as the mentioned innovative experiences indicate, a framework in which it is important to work on a short and long term proposal. The most urgent thing is to identify the zones contaminated by the coffee rust (e.g. zones of San Juan del Río Coco), and, to prevent it from continuing to spread, declare them emergency zones (“quarantined”) and provide them with holistic treatment of the infected coffee farms: direct treatment of the fungus with copper and other fungicides, regulation of the shade and management of the tissue (pruning and new branch sprouts depending on the plants and areas damaged), fertilization (chemical or organic) of the plants that will be left weaker due to the regulation of shade, and economic reasoning of the technical measures; this support should include policies that would keep the small scale producers from a drastic drop in income, for getting over indebted or falling once again into the claws of the crop lien system, because that would mean the expansion of the coffee rust and the impoverishment of the small producers. Parallel to these urgent measures, the following policies are fundamental. First, renovation of the coffee, taking into consideration in decision making varieties that have better prices (e.g. 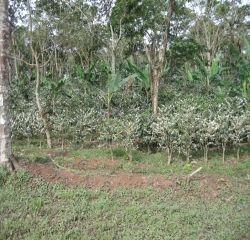 caturra), but that require more investment to resist coffee rust, and varieties that are resistant to coffee rust (e.g. the timor or catimor hybrid), but that get a lower price, are more productive and more demanding of fertilizer. 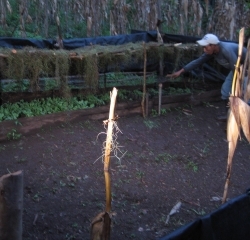 Secondly, a combination of credit (for renovation), technical assistance, markets, and organization of the producers; this should include incentive policies (for example, financial awards) to producers that take decisive steps in good coffee management and incentives for efficient and transparent organizations, measures that would roll back the crop lien system. Third, policies that have an impact on calibrating scales, and on making the quality control of coffee transparent as well as the pricing for the different levels of quality. Fourth, financial education so that the chain of actors save and invest with a perspective of ongoing learning. To make these policies viable requires a state much more willing to create a consensus around their policies toward coffee growing and the coffee growers, not just at the level of the chain, but also at the territorial level. Only in this way will public policy be able to respond in the best way to the agro-ecological, social and economic diversity of the productive contexts of coffee growing. The territory can become the privileged space for articulation among the sector policies and the actors and their local initiatives. This orientation in favor of territorial development means a new role for the State that has to combine a function of normative regulation, of support for investment (infrastructure, etc.) as well as being a catalyst for negotiated processes. Specifically linked to this last point, it would try to ensure that the small producers and those that are most impoverished, as well as their organizations, count and their proposals are heard.